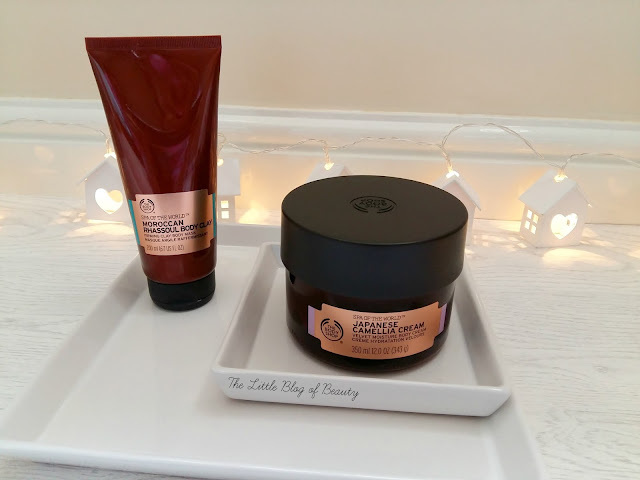 Back in August The Body Shop launched their new Spa of the World range and I was sent a few products to try out including the Moroccan rhassoul body clay*, Japanese camellia cream* and Thai lemongrass massage oil. Today I'll be giving you my thoughts on the body clay and camellia cream. I was excited to try both products but the one I was most intrigued by was definitely the body clay. Although this is probably the sort of product you'd find as standard in a spa setting I believe this might be the first product of it's type, at least that I'm aware of, available on the high street (please correct me if I'm wrong). Still living at home with my parents (yes I know, still at home in my 30s, life went wrong!) it's not easy for me to wander around half naked with large amounts of product slapped all over my body (although they probably wouldn't bat an eyelid) so I saved this until they were away and I was in desperate need of a pamper night. I started running a bath (which takes forever because there's no pressure behind the hot water) and applied this to the top half of my legs. I don't like to show any leg above my knees because I have huge knees and the tops of my legs look 'puffy' when I stand. So I thought this was an area this product might help with. As you can probably imagine if you've ever used a clay face mask, this is pretty messy to apply. If you're thinking of trying this product Id suggest picking up the brush you can get to go with it or it'll probably end up everywhere. Basically you pop some in your hand, or on the brush, and slap it on. Although it's a wet clay as you start to apply it does feel quite dry for spreading over a large area, so it does take a little bit of work. This comes out a typical clay mask kind of colour but I found as it dried it looked like it almost disappeared, ending up a light grey colour. Once dry you can jump in the shower and scrub it off or like me jump in the bath and soak it off, with a little bit of hand scrubbing to help it along. I don't think I could say that this provided any long term results, whether for just a few hours or longer, but for me this product was more about enjoying the experience of using it. From the cooling sensation when first applied, to the tightening effect as it dried and the slight scent I could detect, it just really helped to relax and calm me down when I really needed it. I think there was a slight 'tightened' effect after use, but I don't think this stayed around for a prolonged period of time. I've been using the Japanese camellia cream for a few weeks now and I really like it. I like The Body Shop's body lotions but I'm not keen on their body butters as they're too thick for my skin and don't absorb well, a problem I have with a lot of body products. The camellia cream is like a middle ground between a lotion and a butter; it's much thicker than a lotion but lighter than a butter because of it's more whipped cream texture. With this I find even if I use a little too much it still melts into my skin after a few minutes and doesn't leave anything sticky or tacky behind. There is a slight scent to this product but I really couldn't tell you what it is or describe it. I'm guessing maybe it's what Japanese camellia smells like. I'm really enjoying using this and although it is a little pricey it comes in a huge tub (really not ideal for travelling!) so it should last a while, especially if you save it for a pampering treat on special occasions. In general the products in the Spa of the World range are a little more expensive than some of The Body Shop's other products but the price is justifiable for a spa range that is slightly more luxurious and more for occasional use. The Moroccan rhassoul body clay is £16 and the Japanese camellia cream is £23. Have you tried any products from the Spa of the World range? Lovely post, Becky - I've heard nothing but great things about this range - I need new beauty products like I need a hole in the head but I feel a little purchase coming on!